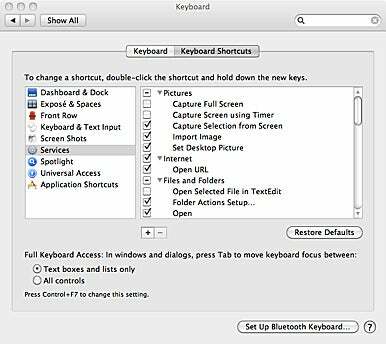 As it does in every major upgrade to Mac OS X, Apple has renovated System Preferences in Snow Leopard, reorganizing individual panes and changing the layout of settings within panes. You’ll also find new settings and wonder where some old ones went. Here are some of the most notable changes. Accounts This pane now provides the option of joining a Network Account Server. Appearance You can no longer specify a font smoothing style (Leopard let you choose from Automatic, Standard, Light, Medium, and Strong); you can choose only whether or not to use the feature and the font size at which it automatically turns on or off. Date & Time The most immediately obvious change is that the map of the world you use to choose your time zone is wider and higher-resolution. But the change many OS X users will really welcome is the capability to show the date in the menu bar, using the new Show Date option. Unfortunately, you can’t customize that date’s format; you’re stuck with Aug 28. Desktop & Screen Saver The Desktop tab gains a number of new—and impressive—Desktop images. The Screen Saver tab gets a new Shuffle entry that lets you create a custom slideshow based on both stock images and your own photos. Dock There’s now a new option to minimize windows into their parent applications’ Dock icons. See 11 major new Snow Leopard features, or our video of Snow Leopard tricks, for more on this feature. Keyboard and Mouse Formerly combined in one Keyboard & Mouse pane, these are now separate panes. Each includes a button to set up a Bluetooth keyboard or mouse using the Bluetooth Setup Assistant; if you’ve got Apple’s Bluetooth keyboard or mouse paired with your Mac, each pane now includes the respective battery-level indicator. In Snow Leopard's Keyboard preferences pane, you can now enable and disable services. More significantly, the Keyboard Shortcuts tab has been redesigned for the better. Shortcuts are grouped by category (Dashboard & Dock, Screen Shots, Universal Access, and so on) on the left; select a category and the relevant shortcuts are displayed to the right. This new design is much easier to navigate than Leopard’s “everything in one long list with lots of disclosure trianges” approach. You can also now temporarily disable individual shortcuts. The other big change in the Keyboard Shortcuts tab is the inclusion of Services as one of these categories. Within it, you can not only assign keyboard shortcuts to individual services, but you can also specify which services appear in the Services menu. For more on that, see Rob Griffiths’ “Services step out in Snow Leopard” and our Macworld video. 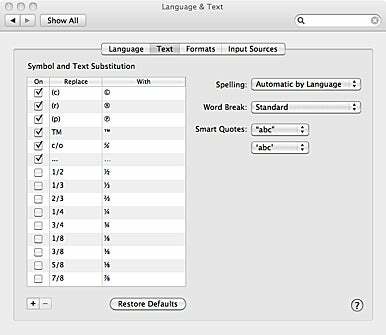 Snow Leopard lets you set system-wide text substitutions, so you can (for example) replace 1/3 with a typographical fraction. Language & Text Previously known as the International pane, it now has a Text tab that offers a significant new feature: symbol and text substitutions. Similar to the functionality of Microsoft Office’s AutoCorrect and utilities such as TextExpander and TypeIt4Me, Substitutions will automatically replace one text string with another as you type. (Again, see “11 major new Snow Leopard features” and the Macworld video for more details.) Tip: When you’re adding your own substitutions, you can paste text from the Clipboard instead of typing it, and pressing Option-Return—instead of Return—inserts a line-break in the substitution text. Unfortunately, these substitutions don’t (yet) work in all apps; for example, they work in Pages, TextEdit, and iChat, but not in BBEdit or Word. Developers need to add the right hooks in their software to gain this feature. Snow Leopard’s substitutions feature also isn't as powerful as dedicated text-macro programs. But for many people, it will be enough. MobileMe There’s now a new sync option: Always Keep The Most Recent Version of a File. With this option selected, if you work on the same iDisk-hosted file on multiple computers, the newest version will be kept when you sync. QuickTime This pane is gone. See Jon Seff’s “Snow Leopard: Quicktime X” for full details. In the Security preference pane, you can specify a delay before you need a password to exit the screen saver. Security The Security pane has undergone some big changes from Leopard to Snow Leopard. For starters, if you opt to require a password when waking the computer from sleep or the screen saver, you can now specify a time-delay (5 seconds; 1, 5, or 15 minutes; or 1 or 4 hours) before that password is necessary. 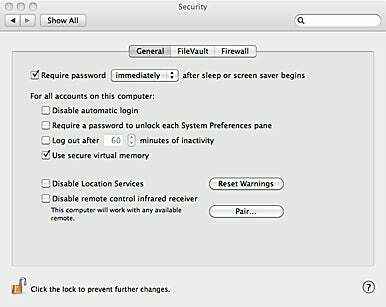 You can also disable Snow Leopard’s new Location Services (see “Snow Leopard’s little changes”) in the Security pane, as well as reset warnings and permissions for applications. Finally, the firewall settings have been revamped considerably. The main firewall tab provides a simple On/Off setting; to configure the firewall, you click the Advanced button. Your options now include blocking all incoming connections, automatically allowing connections to signed software (those with a valid certificate authority), enabling stealth mode, and configuring individual firewall rules. Leopard’s option to enable and view firewall logs is gone. Sharing First, there’s a new Scanner Sharing entry for sharing a USB-connected scanner with other computers on your network; in Leopard, this feature was hidden in the Image Capture application. Second, the Printer Sharing screen has gained the same access-control interface as File Sharing, letting you choose—by user and by printer—who can print to which printers. Trackpad On older Mac laptops with multi-touch-capable trackpads, this pane adds settings for the new four-finger multi-touch gestures. (In the initial release of Snow Leopard, these gestures have some glitches; see Rob Griffiths’ “Snow Leopard’s old and new annoyances”). Universal Access This pane now allows you to convert stereo audio to mono; the resulting mono audio is played through both channels, a boon for the hearing impaired. (For more on Snow Leopard’s accessibility tools, see Christopher Breen’s “Snow Leopard makes strides in accessibility”.